This Morel mushroom pasta with Morel air is one of my favorite dishes. The Morel mushroom's delicate balance of earthy, nutty, and smoky flavors combined with a red wine reduction sauce is perfect. The Morel air adds a delicate touch that is hard to resist. Soak the dried Morel mushrooms in 400 ml of water for about 30 minutes. Squeeze the mushrooms to remove any water excess, cut them in large pieces and set them aside. Keep the water you used to soak the Morels since you are going to use it for the Morel air and the pasta sauce. We are now going to prepare the mix for the Morel mushroom air. Mince the garlic clove and small shallot and sauté them in a non-stick pan with just one drop of oil. If you use too much oil you may have difficulties creating the Morel mushroom air later. Add the red wine and stir to scrape up the pan and evaporate the alcohol. When the wine is almost gone, add the reserved water used for soaking the Morel mushrooms. Stir for a few minutes on the heat and then pass the mix through a fine sieve. Let it cool down in a high container wide enough to collect the air (about 25 cm / 10 in). Using an immersion blender, mix in 2 g of lecithin powder (should be 0.6% of the resulting liquid weight, 2 g assumes the final weight of the mix is 330 g; adjust as necessary). To produce best results, the mix needs to be cold. 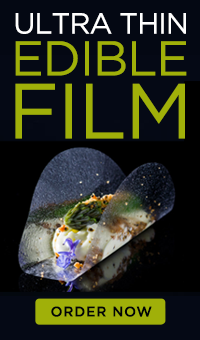 Place it in the fridge until one minute before you are ready to start plating and then produce the Morel mushroom air. To produce the Morel mushroom air, you will have to lift the blender to the upper part of the liquid surface to incorporate as much air as possible so that a foam forms on the surface. Once you have enough foam on the surface, let it rest of 1 minute so that the foam sets and the excess of liquid is eliminated. Proceed to remove the foam with a slotted spoon and serve. Sauté reconstituted Morel mushrooms, minced garlic cloves and chopped shallots over medium-high heat in butter until tender, or for approximately 4-5 minutes. Deglaze pan with the Morel soaking liquid, beef stock and red wine. Add thyme and rosemary sprigs and reduce the liquid. Finally add heavy cream and simmer until desired thickness is reached. Season with salt and pepper. Remove the thyme and rosemary sprigs. Add cooked pasta and mix for a couple of minutes while you produce the Morel mushroom air. 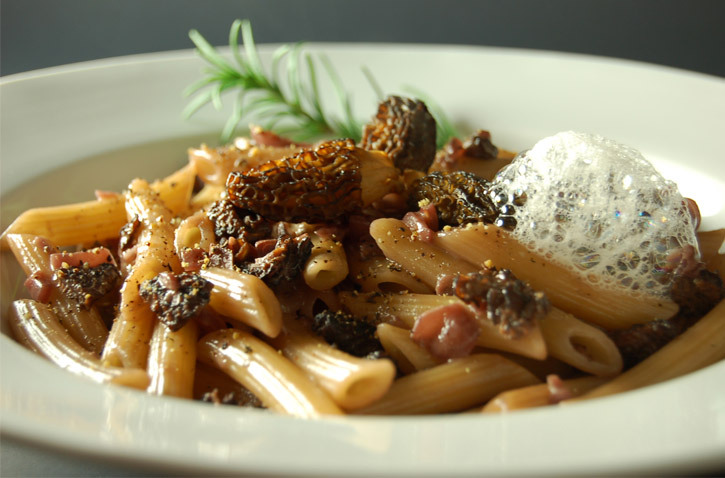 Serve pasta on a plate and carefully add a scoop of Morel mushroom air. Decorate with a fresh thyme or rosemary sprig. Serve immediately before the air destabilizes with the heat.